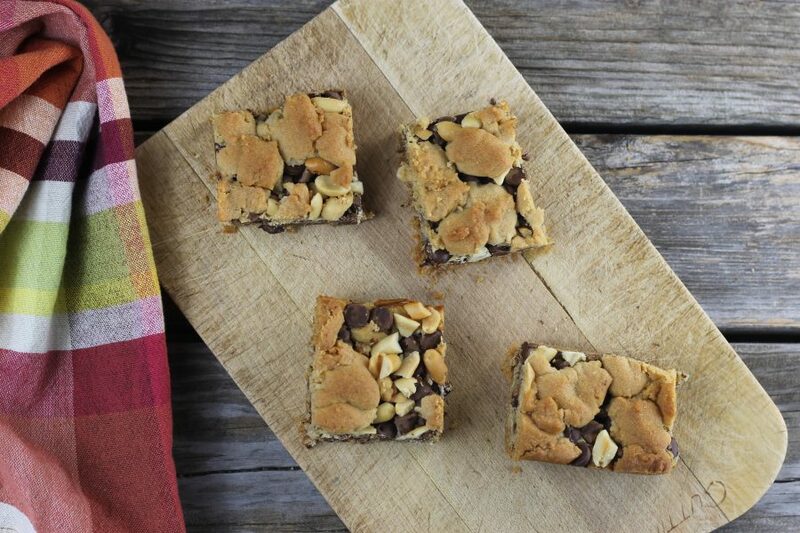 These peanut butter cream cheese bars are a scrumptious way to fulfill you peanut butter cravings. Mike is not a fan of peanut butter. I know it is hard to believe. Our kids give him a hard time because he loves to eat peanuts, but he doesn’t want anything to do with peanut butter. They just don’t understand how someone can love peanuts could hate peanut butter so much. I guess I have a hard time understanding myself, but it’s been that way ever since I have known him and know that there is no way of changing things around. Me, on the other hand, I get cravings for peanut butter. There are days when I am at work and I would give anything for a scoop of peanut butter. With that being said I don’t make a lot of foods with peanut butter, but once in a while, I have to do it. Thank goodness the rest of the family enjoys a good peanut butter dessert. If you like peanut butter, I can almost guarantee that you will love these peanut butter cream cheese bars. 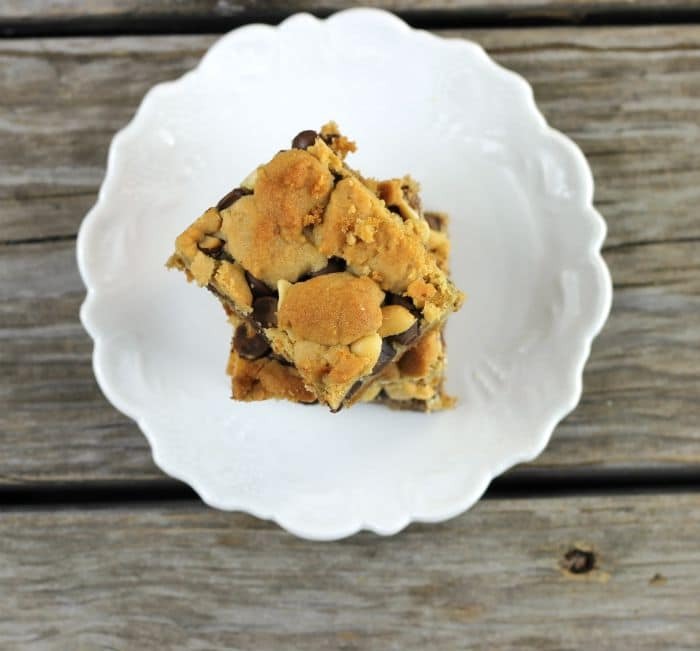 For these bars, I start off making my go-to peanut butter cookie recipe. I reserve 1 1/2 cups for the top. Press the rest of the dough into a 9 x 13-inch pan. Don’t worry if the bottom layer seems a little thin, it will puff up when it bakes. Set the pan aside and prepare the cream cheese filling which has a 1/3 cup of peanut butter in it. Spread the cream cheese mixture over bottom layer. Top the cream cheese with the chocolate chips and chopped peanuts. Crumble the remaining dough over top of the chocolate chips and peanuts. Bake in a preheated oven that is set at 350 degrees F. Bake for about 25 minutes or until the bars are lightly browned and cream cheese is about set. Cool and serve. For the bars - cream together the peanut butter and the butter in a medium bowl. Add the brown sugar and 1/2 cup sugar and mix in. Mix in the egg and vanilla. Sift together the flour, baking soda, and salt and mix in. Reserve 1 1/2 cups of dough. Pat the rest of the dough in a greased 9 x 13-inch pan. Prepare the cream cheese filling- In a medium beat the cream cheese with an electric mixer for about 20 seconds. Add in the peanut butter and beat in. Cream in the sugar. Mix in the egg just until combined. Add the vanilla and mix in. Spread the cream cheese filling over the bottom layer. Sprinkle the chocolate chips and chopped peanuts over top of the cream cheese filling. Crumble the reserved dough over top of the chocolate chips and peanuts. Place the bars in the preheated oven and bake for about 25 minutes or until the bars are lightly browned. 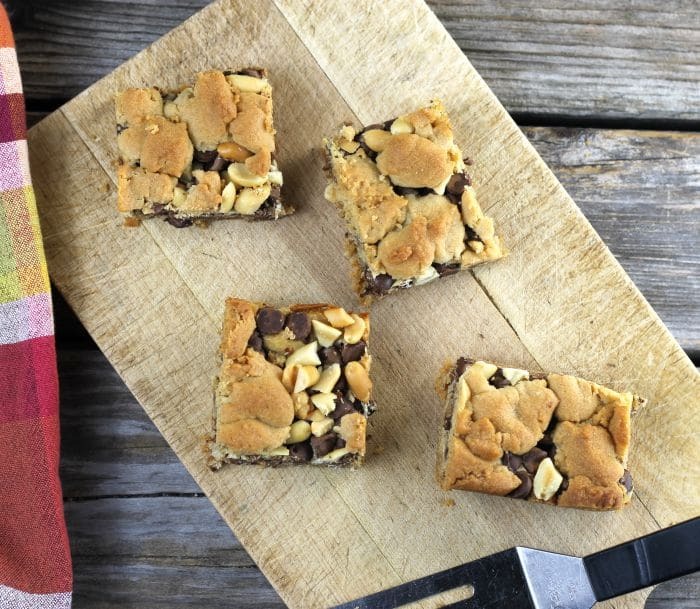 I can’t resist anything with peanut butter 🙂 These cookie bars look fabulous. 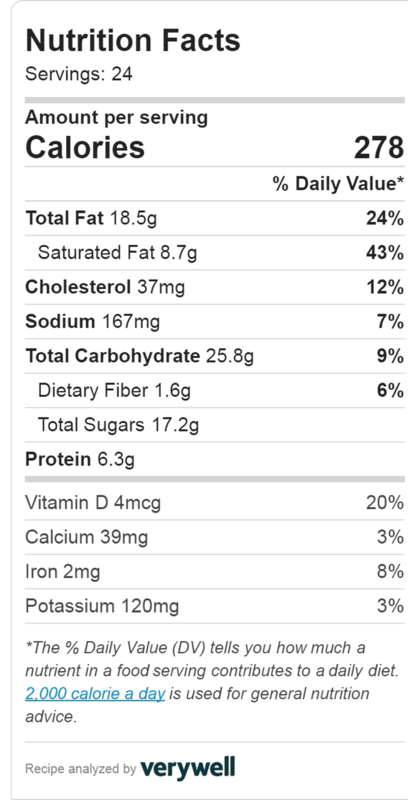 I do not like plain peanut butter one bit—and I ate some peanuts on a flight last month and felt the same way about them. 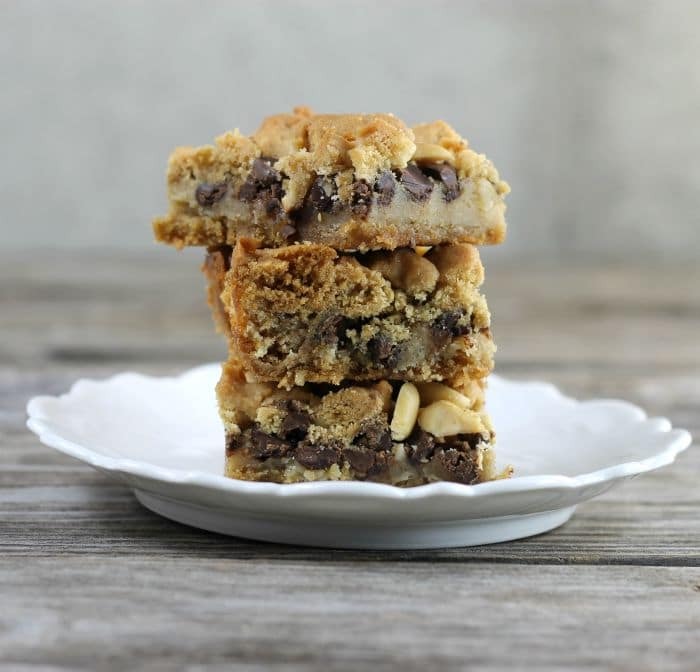 BUT I love pb desserts and these bars look scrumptious!! They look positively delectable Dawn! Big peanut butter lover here especially in baked goods. I love that you also made a crumbly topping. Everything I love wrapped up in one. That’s interesting that Mike loves peanuts, but doesn’t eat peanut butter. I mean it’s just ground up peanuts! 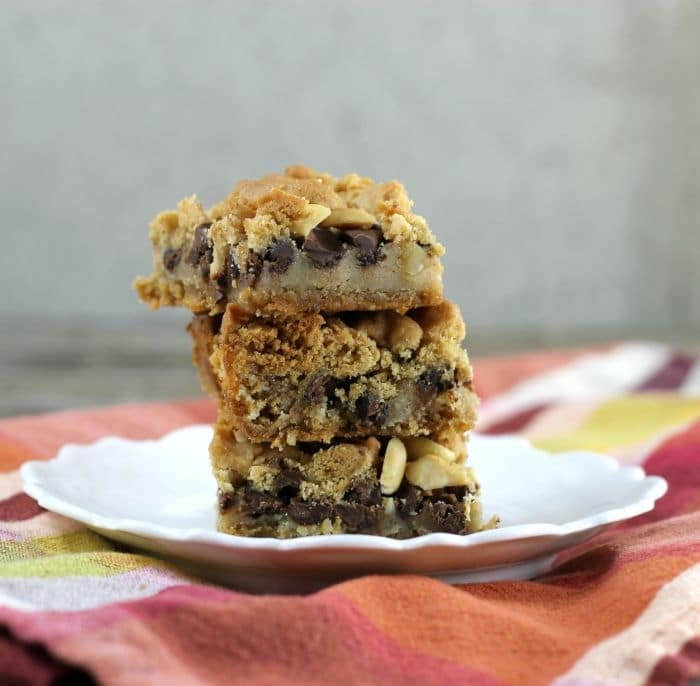 But then again, that just means more for you when you make delicious treats like these bars. These sound like they wouldn’t last long at all around my house!